DIY Pillows – Crazy for D.I.Y. January 20, 2011 October 28, 2016 • Crazy for D.I.Y. I absolutely love it when a family member or friend wants me to make them a special pillow to go with their decor. It can be so much fun because it’s easy to make and there’s more time to focus on embellishments. 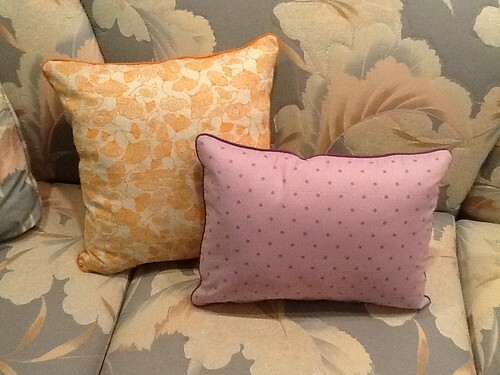 I was given two 20″ square upholstery fabric samples to make 2 pillows out of. 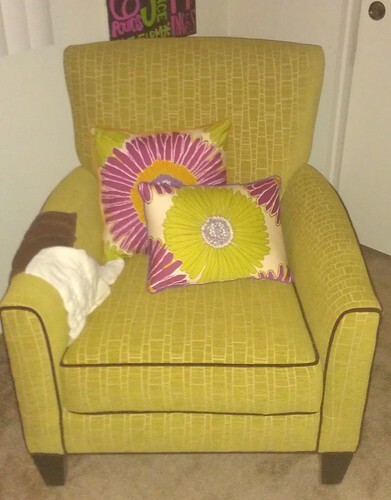 Color scheme was to go with the olive green nursery chair for soon to come little baby Zoe. I went to Joann’s to pick up 2 pillow forms (I try to NOT get the same size or shape when in a set), 2 fat quarter fabrics for the back of pillows, and 2 piping accents. Piping is always a wonderful way to embellish your pillows. It’s a little tricky to get used to but well worth it! With my 50% off coupon, pillows being BOGO free and $1 fat quarter sale, I was able to pick up all the supplies for $19. Since these pillows are for the nursery where bottle feedings will commence, you know these pillows will need to be washed once in awhile. So I thought it was super important to add hidden zippers and luckily I found two white zippers in my sewing stash. Hidden zipper – shortcut: stitch witchery with re-enforced hand stitching. Posted in SewingTagged Baby, custom, diy, Fabric, girl, nursery, pillow form, pillows, piping, zipperBookmark the permalink.